A bunch of fun new abilities and cool places but Dawnguard is far too glitchy to justify its steep price. You there! How would you like to transform into a vampire lord? You get this fine set of flightless leathery wings, you can throw balls of red magic at people to leech some of their life, and you can summon a pet gargoyle! All for the low low price of I bite you in the neck and it gets kinda weird for a while but then I stop again. 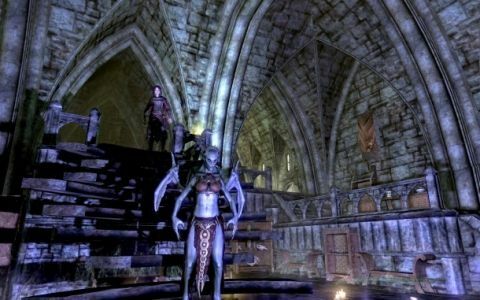 The alternative, in Dawnguard, is to join the Dawnguard, who hunt vampires with crossbows and tame trolls. The vampiric option is a bit more exotic, but both sides seem pretty exciting, don't they? And it's Skyrim! It's already amazing! About the only way this could be a let down is if both questlines steered you awkwardly into the same brain-numbingly dry prophecy guff and it crashed constantly! It's also unbelievably shoddy. The very first quest marker you get is completely wrong, leading to tedious minutes trying to climb a mountain that has nothing at the top. Half the characters keep repeating their greetings on a maddening loop, then cut their plot-critical lines short after a few words, omitting essential information. When I first got the ability to turn into a vampire lord, actually doing so caused every vampire in the vampire mansion to attack me for being a vampire. The worst kind of racists. Vampire Lord mode, while an excellent phrase, is generally problematic. Entering it disables essential functions like the map, first-person mode, the ability to interact with quest-critical objects, and even the ability to bring up the magic menu to select the 'turn back into a human' option. Instead you have to fumble around to discover your favourites menu has secretly been replaced with a new one, and it's one of the skills on there. I'm playing with no mods installed, and Dawnguard regularly crashes to desktop. On one PC that runs Skyrimperfectly, it crashes consistently at the same point in Dawnguard, rendering it uncompletable. Even after a patch, it's still buggy. It's tough, because Dawnguard takes you to some beautiful places. They have all the visual drama of Skyrim's most spectacular views: a lonely rope bridge over a heart-stopping ice chasm, a secret glade filled with amber light, a winding path leading out of an underground mushroom forest and into the blinding white cloud of a mountaintop. Exploring these has a real sense of adventure, and that's Dawnguard's biggest strength. But because they're sprinkled across disconnected islands, caves and alternate realms, you never get the sense of a whole new land to explore. The Elder Scrolls community is already churning out gorgeous new places like this, not to mention new abilities. The things Bethesda can potentially do better are story and quality assurance, both of which they bungle spectacularly here. There's fun stuff in Dawnguard, but £14 ought to buy you something a hell of a lot more polished. When originally published this review carried a score of 69, instead of the 59 that appeared in the magazine. This was an error and has since been corrected.